Take a look! What comes to mind? This is decadence! Mmmmmmm, chocolate and orange. 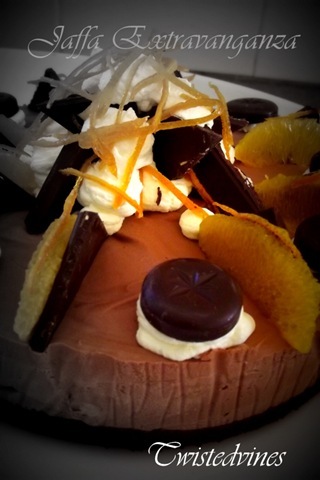 Chocolate and Orange cheesecake! 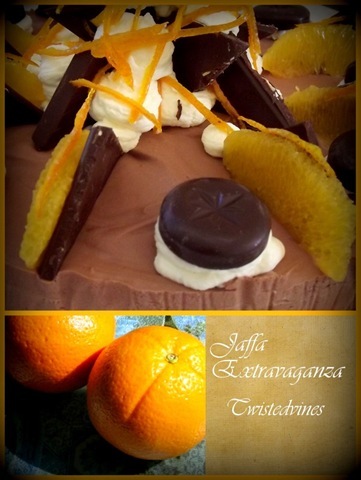 This cheesecake has a rich smooth texture, dressed to impress with a luscious chocolate mousse filling,chocolate biscuit base, garnished with tangy orange segments and orange scented chocolate. Remember small slices! 2 x 250g Philadelphia Cream Cheese, softened to room temp. 2 fresh oranges rind only to make citrus peel. or Lindt orange chocolate thins. Orange segments and citrus rind. See my post Tarts with Zing where I made citrus peel (lemons) its the same recipe for orange peel. Crumble chocolate biscuits in a whiz and combine with melted butter. Press into the base of a lined 20cm spring form tin. Chill. Beat together the Philly cream cheese, sugar and orange rind until smooth. Stir in gelatine mixture and fold in the chocolate melts and cream. Pour filling into the prepared base and refrigerate 3 hours or until set. 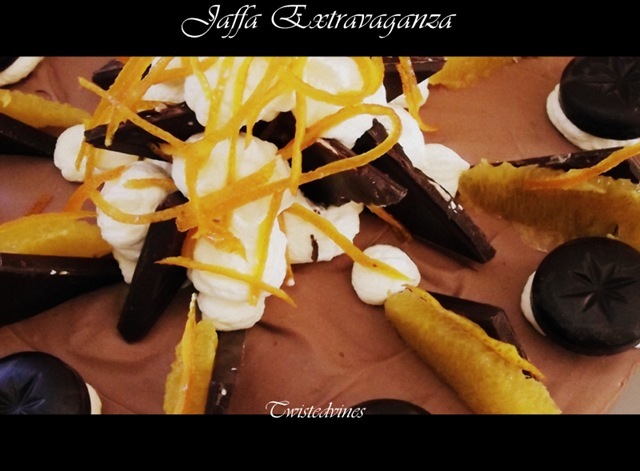 Top the cheesecake with fresh orange segments, chocolate orange segments, chocolate thins, citrus orange peel,extra fresh whipped cream. For an added luscious appearance: dressed in style, crumble biscuits roughly and add to sides of cheesecake. Oooh too much! 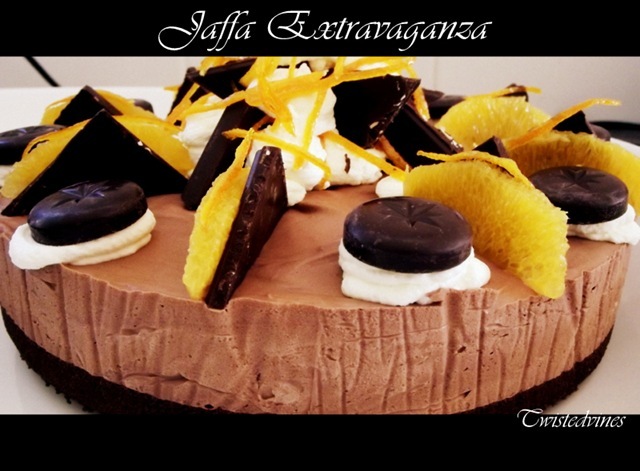 The Jaffa Extravaganza was made and decorated by my sister. Shining in talents. A favourite of many cheesecakes made for special occasions. Photography exclusive to Yvettes Twistedvines. So decadent. You definitely should create a dessert cookbook. With your recipes AND great photos it would surely be a hit. Wow! This looks like something you would get at a fancy restaurant or bakery. It certainly is a very rich cheesecake, but one that surely will satisfy chocolate lovers. As I wrote…just small slices for a supreme chocolate taste! “Extravaganza” is right! This is one decadent cheesecake, Yvette, and beautifully prepared and photographed. Wonderful! Thanks John, Happy Easter=Buona Pasqua. Have a wonderful day with family and friends. Thanks, Yvette, and a happy Easter to you & yours! Once I made a chocolate cheesecake, and it came out so yummy…but it didn’t look anything like yours. You truly inspire me to add a little more eye-pleasing touches to things…now if I could find the time to bake…lol…. shining is talent is so right, just gorgeous and i am CRAVING A SLICE!